WASHINGTON, Jun 19 2013 (IPS) - Reactions have been mixed to President Barack Obama’s call for greater nuclear arms reductions in the United States and Russia, made during his speech in Berlin on Wednesday. The president addressed about 6,000 invited guests at the Brandenburg Gate in Berlin, marking 50 years after U.S. President John F. Kennedy made a similar speech at the height of the Cold War. "So long as nuclear weapons exist, we are not truly safe." Obama announced he would push to work with Russia to reduce the number of U.S. and Russian tactical weapons in Europe, as well as the total number of strategic nuclear weapons deployed by both countries. Others lauded the president’s call as critical, if belated. “The Berlin Wall fell more than two decades ago, and these reductions are long overdue,” Lisbeth Gronloud, a senior scientist and co-director of the Global Security Program at the Union of Concerned Scientists, an advocacy group, said Wednesday. “The president’s initiative implicitly acknowledges that today nuclear weapons are a liability, not an asset,” Gronloud added. The New START Treaty of 2010 limited U.S. and Russian stockpiles to 800 missiles, bombers and submarine launchers each, as well as 1,550 deployed strategic warheads. The Obama administration is now proposing cutting each country’s strategic warheads by a third, which would leave the United States and Russia with slightly over 1,000 nuclear weapons each. “Bipartisan national security leaders agree that further, deeper nuclear reductions would increase U.S. security, lead to budget savings, and help pressure other nuclear-armed states to join the disarmament enterprise,” Daryl Kimball, executive director of the Washington-based advocacy group Arms Control Association, said Wednesday. According to the Arms Control Association, the United States spends an estimated 31 billion dollars annually to support its arsenal of deployed strategic nuclear warheads and associated delivery systems. If the country reduced its deployed strategic warheads to 1,000 or fewer, the group estimates, taxpayers would save some 58 billion dollars over the coming decade. With terrorist and cyber attacks increasingly prevalent in recent years, analysts have stepped up calls for the U.S. government to re-evaluate whether a massive nuclear arsenal remains the most relevant way of addressing those threats, particularly given the hundreds of billions of dollars in upkeep those arsenals require. Obama has renewed commitments to the U.S. ratification of the Comprehensive Test Ban Treaty, which forbids all nuclear test explosions. Ratification of the treaty has already failed once in Congress, however, and the president has set no new deadline for submitting it to the Senate. 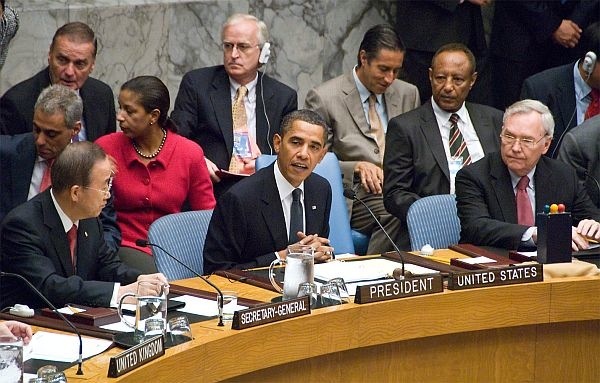 Obama has also stated that he plans to hold the fourth meeting of the Nuclear Security Summit, a biennial meeting to prevent nuclear terrorism around the world, in 2016, with the United States hosting the talks. The administration now hopes to work with NATO allies to come up with concrete proposals for reducing the world’s stockpiles of tactical nuclear weapons, which are not covered by the New START Treaty from 2010. Russia, which has many more tactical weapons than either the United States or Europe, has been resistant to such reductions in the past. On Wednesday, Russia’s initial response to Obama’s call for reductions was lukewarm. One senior foreign policy adviser to Russian President Vladmir Putin said Moscow wants to “expand the circle of participants” of countries reducing their nuclear arms. “How can we take seriously this idea about cuts in strategic nuclear potential while the United States is developing its capabilities to intercept Russia’s nuclear potential?” Russian Deputy Prime Minister Dmitry Rogozin told reporters in St. Petersburg. In the United States, some civil society voices are suggesting that Obama’s new proposals sound suspiciously repetitive. Republicans in Congress, meanwhile, have already made it clear that they will push back against any treaty that proposes cuts deeper than those proposed in the 2010 New START Treaty, suggesting that the proposed reductions would hurt U.S. security. “I do not believe the American people will support the president’s policy, which will serve only to weaken our nuclear deterrent and our ability to deal with threats to our strategic interest in the years to come,” James Inhofe, a conservative senator and ranking member on the Senate Armed Services Committee, said Wednesday. According to LCNP’s Burroughs, if proposed cuts made it into the treaty, it is not certain they would receive the required two-thirds majority in the Senate. However, he said a political understanding between the Obama administration and the Russian government would not actually require congressional approval. But he also warned of severe objections to proceeding in that direction. “The steps that Obama was talking about taking with respect to tactical nuclear weapons or the long-range strategic weapons is basically making any U.S. reduction contingent on Russian reciprocity,” Burroughs told IPS.